This exercise is a very effective way to improve the ability of the rider to stay centred and straight in his/her position and to keep the horse perfectly symmetrical with an even support on his 4 feet. The first part of this session is about flat work to get the horse and rider in a good disposition without the complication of dealing with a jump yet. The simple fact of alternating between turns and straight lines, with some flexi-jump as guiding rails, is indeed difficult for a majority of riders. Most of the time, horses are zigzagging on the straight lines and are losing the impulsion in the turns. This exercise will be successful only if the rider is able to anticipate and get prepared for each part of the path while staying focused on his/her position. 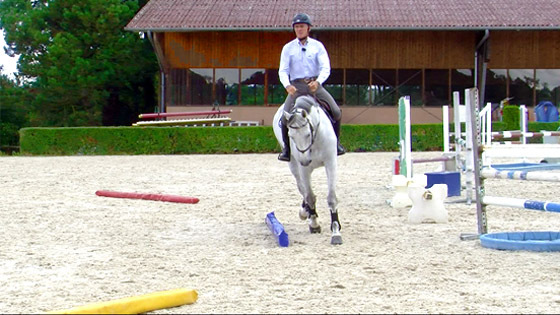 Any shift in the rider’s position compared to the median of the horse, can lead to a shift of the horse on the course. 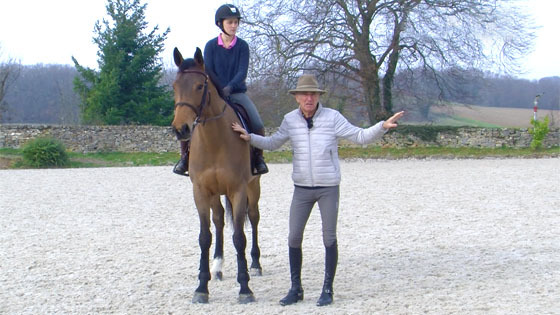 Michel goes through all the key elements to be successful with this exercise in order to obtain a horse in a steady canter with a steady pushing power on a steady track. In this session, Michel teaches Selene and her gelding horse “Amor”. She starts the exercise at a trot. Horses and riders, at a lower level, can start the exercise at a walk once or twice. Starting the exercise at a slower gait will help the couple to get used to the pattern and to implement a good automatism without the difficulty of the speed added to it. As the session goes on, we learn on how important it is to follow the cadence, whatever the gait, in order to keep the horse on track. his second part of the exercise is quite difficult and can be achieved only if both the rider and horse master it at the walk and the trot. This is the reason why the rider has to take his time to practise the exercise and can practise it over several sessions. To be successful practising the exercise at a canter, the horse needs to be available and the rider needs to anticipate and plan ahead correctly. The goal is to keep some light and discreet aids. 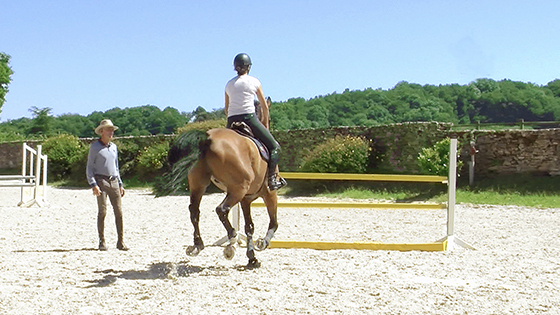 Therefore if the rider has to flail, twist himself, pull or push, or even if he needs to use strength, there is no point in practising this exercise yet. So it is necessary to achieve one step at a time at the lower gaits before trying it at the canter. Michel recommends to start with the most comfortable side for the horse. As seen in the first part of the exercise at a walk and trot, the rider has to be active on the right and then his left side staying centred and symmetrical in his position. Michel offers some modifications of the set-up to make the first few practices easier and to gather some positive results before increasing the level of difficulty. Michel gives us also an insight on the mind set we are looking for in the horse and the rider to reach the maximum relaxation while keeping the canter rhythm steady. At the end, you will notice how comprehensive this exercise is. It will take you a certain time to get it, but you will definitively notice the progress you and your horse will make. Practise well! An excellent exercise to test the precision and lightness of the rider’s aids while working on the submission and the suppleness of the horse. The goal of this exercise is to control the horse’s shoulders and haunches on a grid while staying in the same canter rhythm throughout the set-up. The slight curve of the track makes it a bit more challenging as any drift towards the inside or outside of the curve will modify the distance between the fences compromising the steadiness of the canter. The key, to be successful, lies in the rider’s aides which should stay light and discreet and surely not strong and restrictive as many riders would be tented to use. 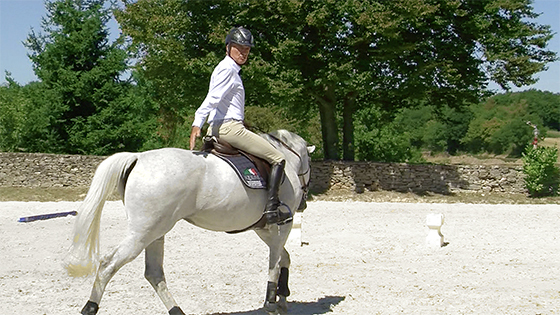 Michel emphasizes on the importance of keeping the horse bent to the inside to improve the correctness of his motion and the use of his top-line. Michel teaches Sélène and her 7 year old horse, Amore. The rider learns that she needs to keep a relaxed position in harmony with the movement of her horse. The slightest tension can disturb her horse’s movements and prevent her from executing the exercise perfectly. The challenge is to give enough freedom to the horse while controlling the steering and the canter rhythm. A challenge that Sélène masters after a few tries. You will be able to get the feel for the ideal position just by watching the slow motion included in the video that you can, then, recreate when you will practise the exercise. 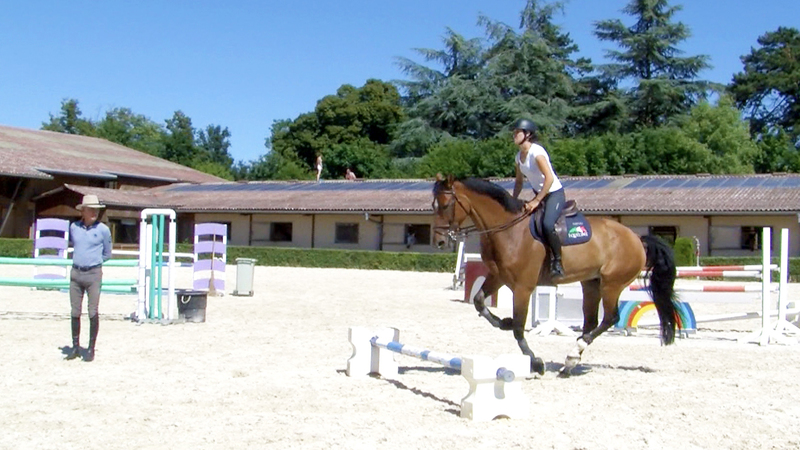 At the beginning, don’t hesitate to practise over ground poles only to set the correct reflexes before raising the bar. We’ve learned that a good oxygenation of the body is a key player in the muscle and mind relaxation. However, to learn to breathe correctly when riding requires some practice. This is today’s focus of this new exercise from Michel. To breathe deeply and steadily when we are comfortably seated in a sofa is no problem. However, when we are challenged by something more physical, the breathing rhythm becomes shallow and spasmodic with some apnea moments. By simply watching how many riders are out of breath at the end of a jumping course, we can realize how difficult it is to breathe correctly while performing a physical activity. However, the correct oxygenation of our body is critical if we want to optimize our physical and mental abilities. As soon as a rider blocks his breathing, his body stiffens, his stress level increases, and he loses the ability to control the situation. As Michel shows us, the horse is also very receptive to the positive or negative signals that the rider’s breathing emits. So it is crucial for the rider to become aware of his breathing and to practise breathing correctly in all circumstances. Michel offers you a small practise session on a ground pole set-up. Don’t hesitate to modify the track and then, to replace the ground poles by some cavalettis then jumps, but make sure you stay in perfect control of the rhythm of your inhales and exhales. Michel offers a specific exercise that is extremely effective to release any tensions the rider might have especially in the arms and shoulders. We all know how bad the rider’s upper body stiffness can impact the horse’s mouth and consequently the comprehension of the aids. 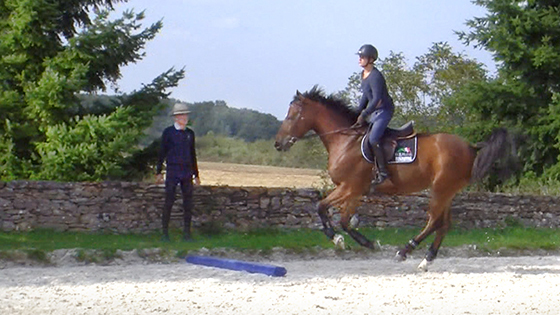 Michel offers an easy solution to correct this bad habit and provides good reflexes suitable for all level of riders. This training will also help the rider stay centred even when turning. The horse can move with more freedom and consequently give more attention to the rider’s aids. Directing a horse with precision becomes then, extremely easy whatever the gait. 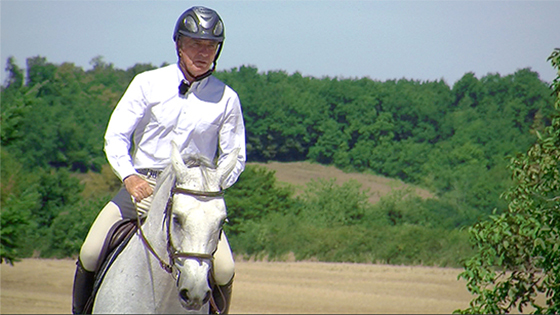 Michel shows us the exercise, riding an 11 year old grey mare. After explaining the advantage of his method, Michel goes over an “easy to do” set-up of ground poles and cones. To begin with, you can replace the ground poles with some cones to go through or around. The exercise is to be done at the lower gaits first and then if successful on it, at a canter. Once you have well mastered the exercise, don’t hesitate to modify the track. You can also practise it on a small course of cavalettis keeping in mind that the upper body relaxation is key. The primary goal of this session is to get the rider and horse to reach a state of serenity. 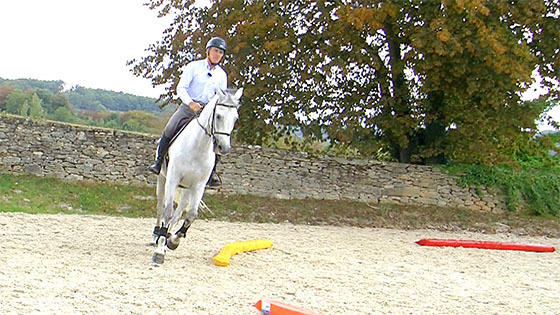 Michel has developed an exercise helping riders to become aware of the moment they lose control of their mind and of their actions approaching a fence. It is well known that the closer the rider is from the fence, the more the emotions or interfering thoughts are taking over which disturbs not only the rider’s position but consequently the horse’s mind and the quality of his canter. For this new lesson, Michel teaches Charlotte who rides Bounty, a quite inexperienced 5 Year Old mare. The exercise begins with riding in between the fences preparing for all the key elements that will lead to a successful jump: a rider in control of her mind and her horse’s mind, well seated with a steady canter and a straight mare. Michel’s professional eye detects any interfering movement from the rider and its influence on the horse. We can see that a good landing is the results of a good approach. Therefore, the rider has to plan each phase of the jump constantly. We will also notice how sensitive a horse is to the slightest disturbance of the rider’s mind. During this session, Charlotte will have to face a situation leading her to become confused. Her hesitation will impact the mare’s behaviour who will take the control over and decide for her rider.